This post is in partnership with KitchenAid. I am doing my very very best to hang onto as much of summer as I can. Granted, I live in southern Arizona so that isn’t very hard, BUT STILL! I love the fun that the summer brings. The outdoor movie nights, the BBQs with family and friends, the pool time, and the food! Ah yes. The food. 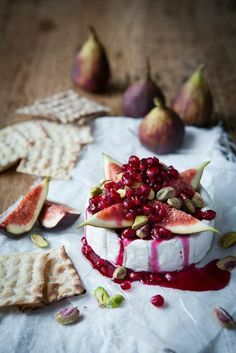 Who doesn’t love the amazing flavor of all the fruits and treats that summer brings?!? When I was scheming up ideas to coordinate with the launch of the KitchenAid Color of The Year, that Bird of Paradise color kept calling to me! It’s all tropical and colorful and so, so good. One of my fave tropical fruits would have to be the dragonfruit. 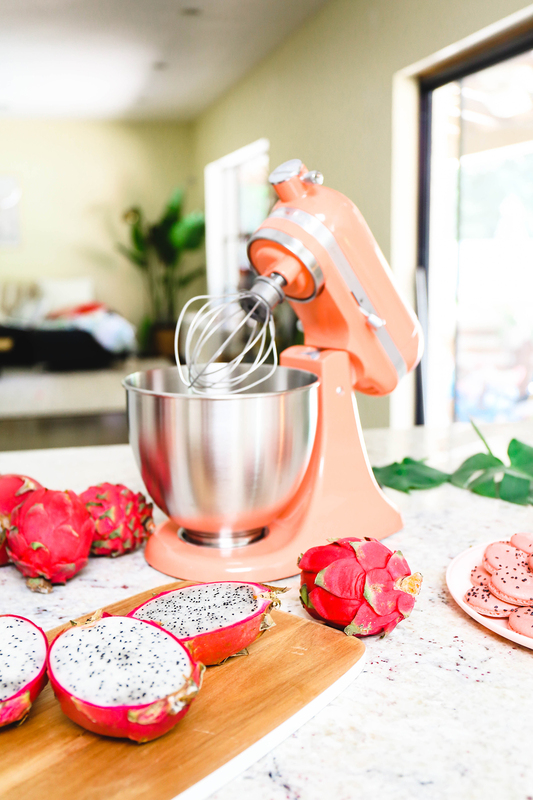 It’s a pretty fruit that just belongs in bowl next to this colorful stand mixer. 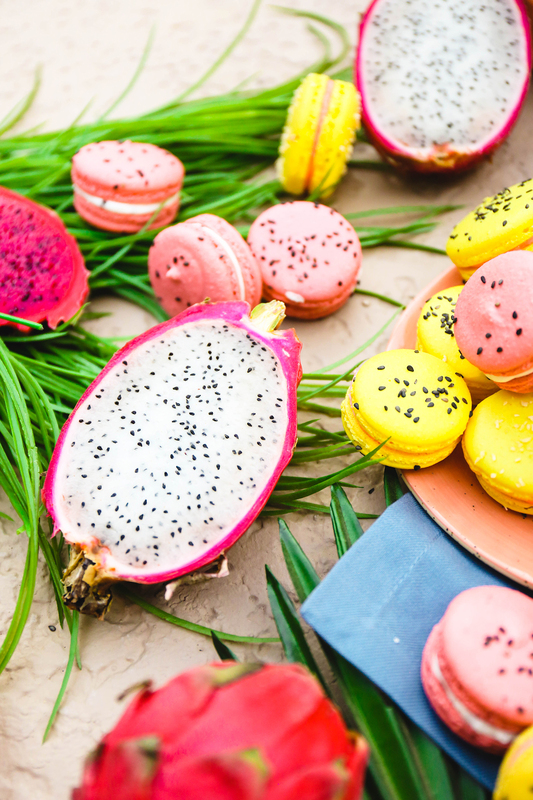 Not only is the dragonfruit pretty, (and boy, is it pretty), but it’s super versatile. Put it in a smoothie, slice it up and toss it in a salad, or freeze it and make a popsicle. You can hollow it out to create a fruity bowl! 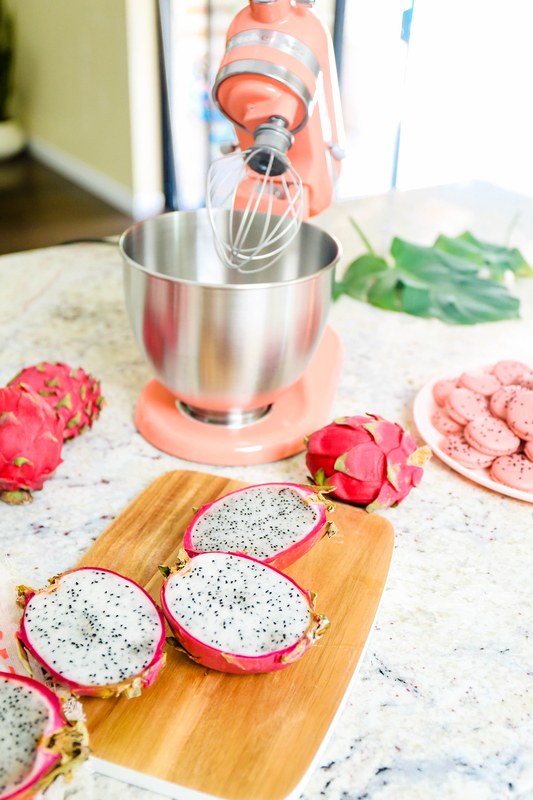 And you can even use it to make the tastiest Dragonfruit Buttercream! We have been on a bit of a macaron kick and I had some extra fruit laying around and thought, “what the heck”? 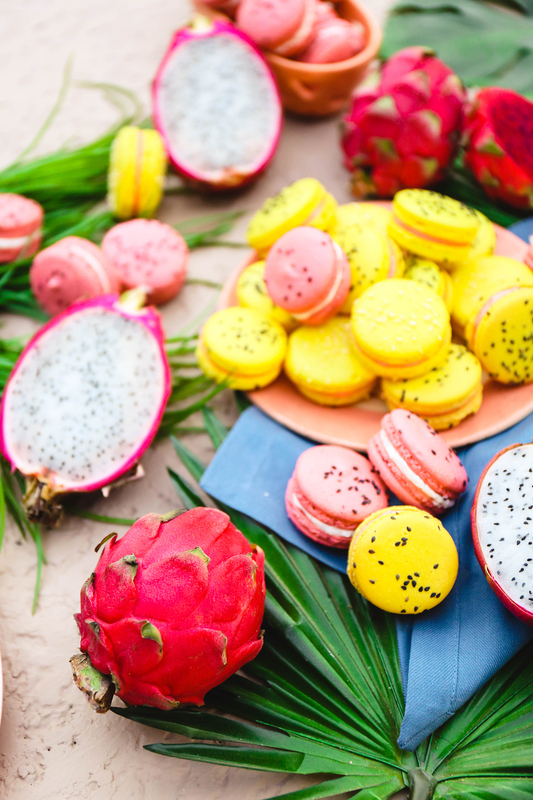 Dragonfruit Macarons, it is! So let’s do this. 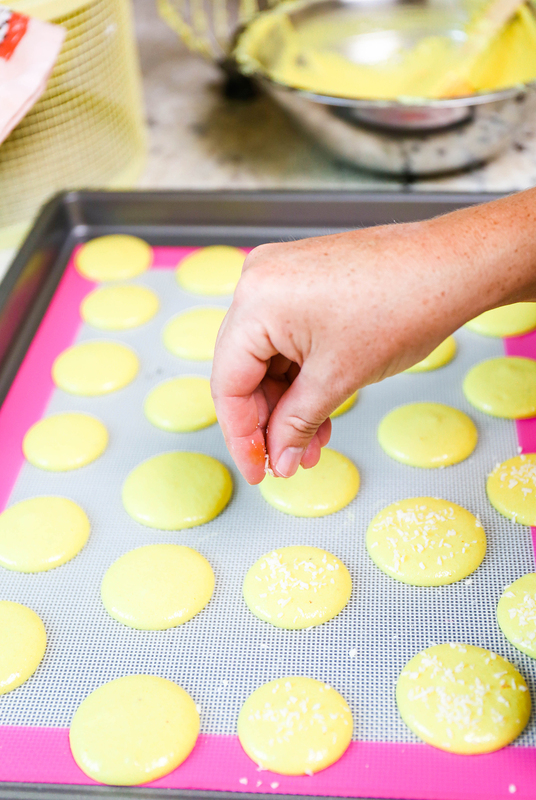 And if you’ve ever wondered how to make macarons, stress no longer! I have partnered with KitchenAid again to share a super simple recipe that will have you feeling like a professional in no time! A large portion of most macaron recipes is made from meringue. 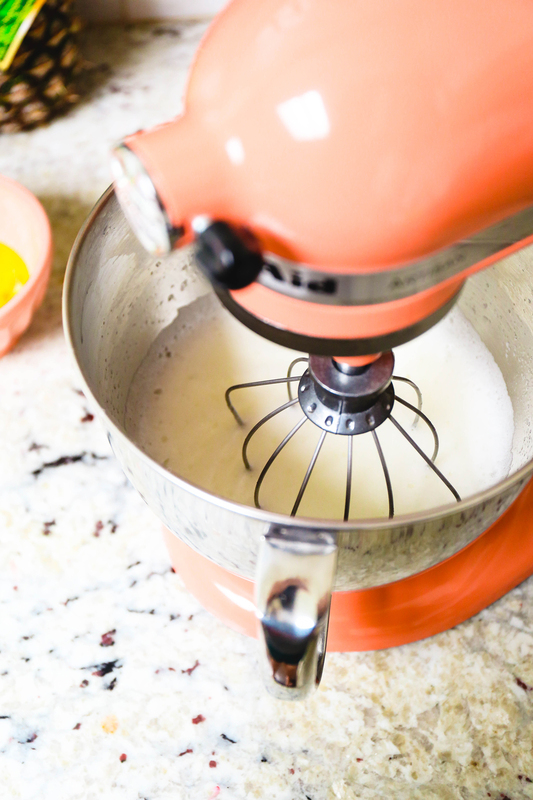 You need to be able to beat those eggs into a frothy and light mixture that resembles a sticky cloud and a stand mixer is kind of the perfect appliance to do that! If you want to color and/or flavor them, add a few drops of food coloring 1 or 2 minutes into the beating process. Just when the mixture is white and foamy. Foam things up and walk away for a hot minute. While the eggs and sugar are beating, combine all of your dry ingredients! 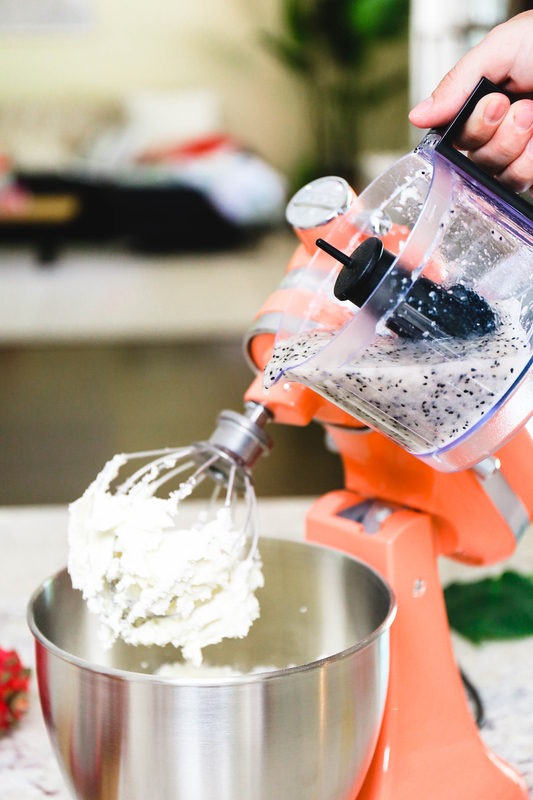 Be sure to smooth everything out by whisking by hand or using a food processor. Once the eggs have reached Sticky Meringue Status (where you can flip the bowl upside down, and nothing spills out), it’s time to add the wet ingredients to the dry! Now, this is the part that gets tricky for some.To help you get the best looking macarons you can, it’s important to stir the mix the right way. And I will always do this by hand! Gently add a little meringue at a time, and stir around the sides of the bowl, and then “punch” down the center of the mix with your spatula. Keep doing this for several minutes as you add in the rest of the meringue. Your arm will hurt! And if it doesn’t, you’re probably a lot stronger than me. 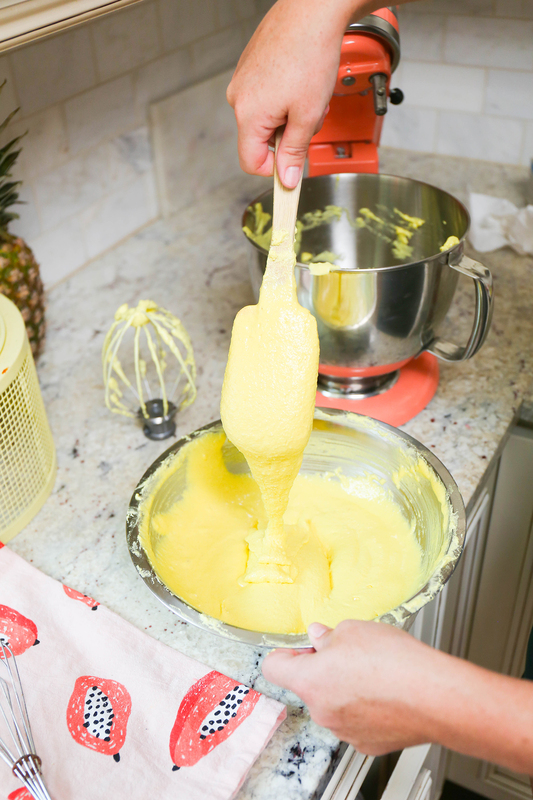 You’ll keep mixing until things are smooth and you can lift a spatula and the batter will drip back down like a ribbon layering over itself. It takes about 10 seconds for the batter to smooth back up on its own. When your batter is “ribboning,” you’re ready. You’re ready, Grasshopper! After you’ve finished piping your circles, pick up the cookie sheet and gently tap it on the counter. Lift it an inch or two off the counter and drop it even. You’re just helping to prevent any pockets of air. 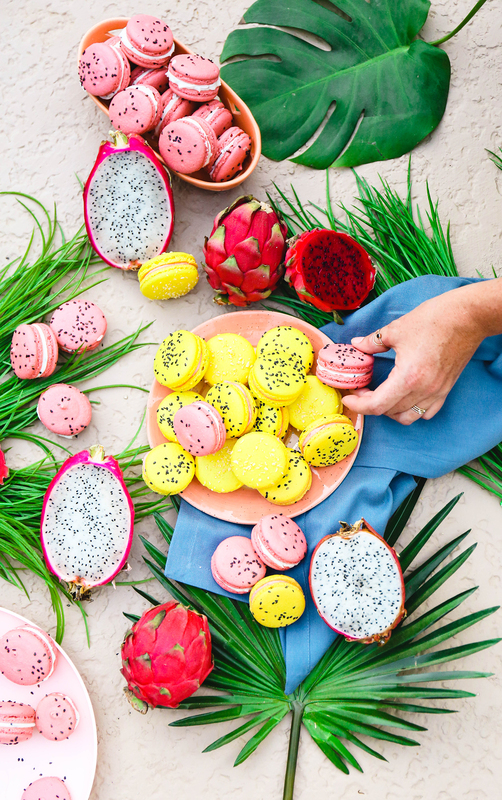 We topped our macs with shredded coconut and black sesame seeds to match the look of the spotty dragonfruit. Let the macarons rest at room temperature for thirty minutes. Gently touch the tops of a few to see if they’re ready to bake. They should have dried a little on the top and are no longer sticky. If they’re still a little sticky, let them rest longer. I’ve let them rest up to an hour before and it’s okay! Bake those suckers at 275 degrees Fahrenheit for about 17 minutes. Depending on your oven, you could go a little longer. You don’t want to over-bake them (the insides should be slightly chewy and awesome when bitten into! ), but you don’t want to under-bake them and not be able to pull them from the pan. It’s a hard line, folks! Your macarons should have tiny “feet” on the bottoms where they lifted from the pan as they baked. Pat yourself on the back! Time to make the buttercream! 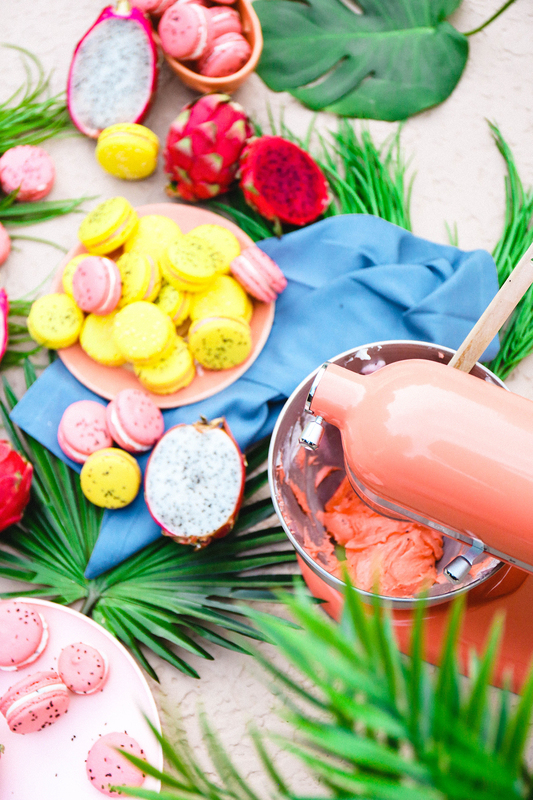 You don’t need a large batch of frosting as you pipe the tiniest amount on each macaron cookie, so the Artisan® Mini 3.5 Quart Tilt-Head Stand Mixer was the perfect companion for this! This little guy is 20% smaller and 25% lighter than the full-size KitchenAid Tilt-Head Stand Mixer, but totally powerful enough to beat any amount of powdered sugar I throw at it. Now, grab some dragonfruit and slice ’em up! I wanted a nice dragonfruit puree and just used a melonballer to hollow out my fruit. I added it to the 3.5 Cup Mini Food Chopper and it quickly made the fruit smooth and ready to add to the frosting mixture. After you’ve mixed the butter and confectioner’s sugar, simply add about 1/4 cup of the fruit puree to the frosting and let the mixer do its job. You’ll want more or less fruit puree depending on how runny you like your buttercream. Obviously, for a cake, you don’t want it to be crazy-crazy thick and stiff. But for a macaron, you don’t want it running out of the sides after you’ve sandwiched the cookie together. I find it’s the perfect thickness when I lift the attachment and there are stiff peaks that don’t slouch. It seriously was the prettiest frosting! I was channeling Cruella de Vil the whole time we were mixing this up. Once your buttercream is ready, add it to a piping bag fitted with any tip and pipe away! Pipe a small amount on the backside of one cookie, and then sandwich it with another! Be gentle as these macs are fragile and crush under angry fingers! So make sure you’re in a good mood when you bake these! I mean honestly. They’re so dang cute. And the coconut flavor combined with the dragonfruit buttercream might just be my new fave combo! Each batch makes about 25 macaron sandwich cookies! So we’ve got macs for DAYYYYYSS over here. And that’s it! 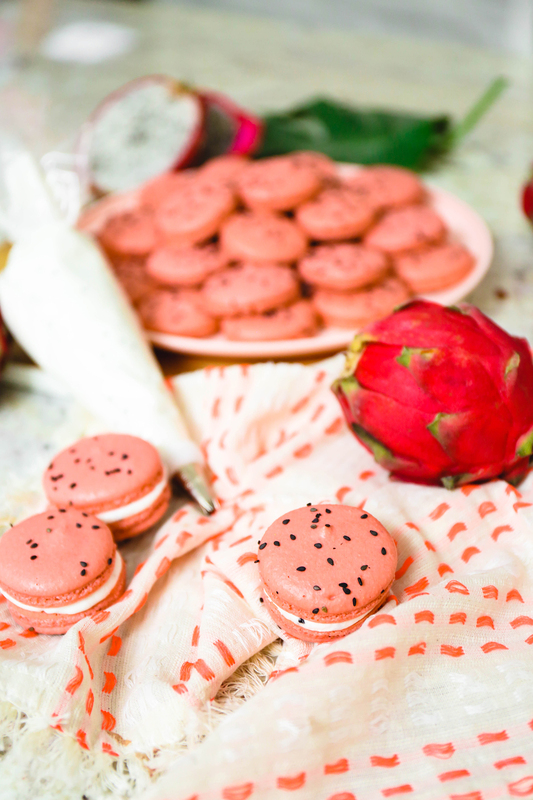 How to make macarons and enjoy them in about one hour! The flavor combos are endless and these really are an easy-to-achieve cookie! (And if you’re looking for ways to decorate them and lots more tips for baking, check out our edible typography macarons that started it all from years ago!) 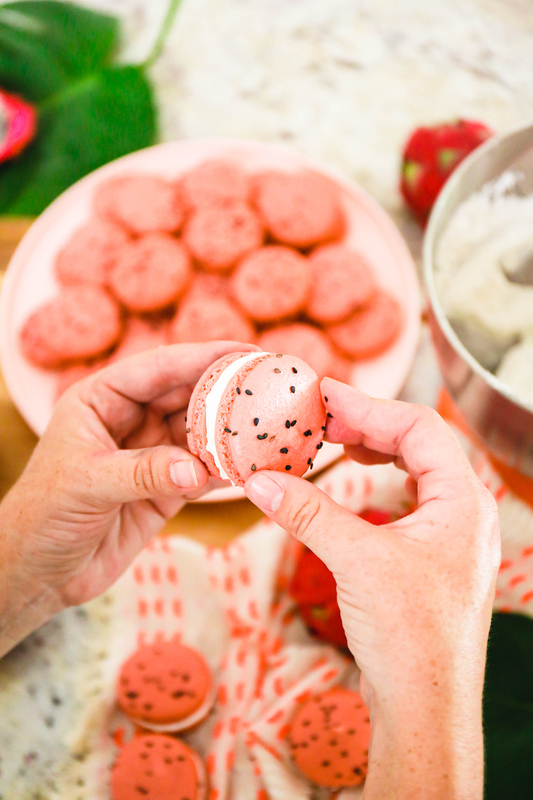 Happy macaron-ing! Check out the entire Color of The Year collection right over here! And if you want to see what other recipes we’ve been cranking out with our new KitchenAid products, head right over here to try this Grilled Pizza Margherita and check out our fun adventure into video! 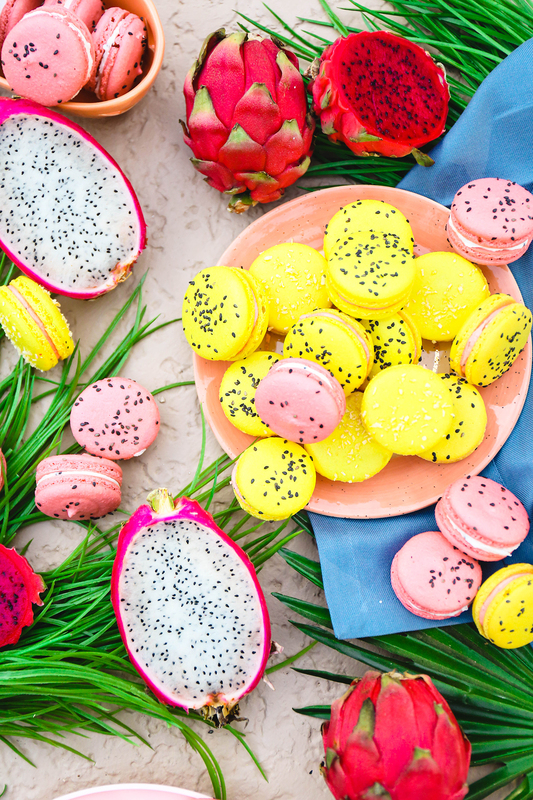 You’ll never again wonder how to make macarons with this simple recipe that’s easy to recreate! Just a few steps and you can enjoy the classy macs right at home! In the bowl of a stand mixer, combine egg whites and baker’s sugar. Beat for one minute until the mixture is white and frothy. Add flavoring and food coloring. Resume beating for several more minutes until stiff and shiny peaks have formed. When you can turn the bowl upside down and nothing spills out, the meringue is ready. In a large mixing bowl, combine almond flour and confectioner’s sugar and mix up with a whisk until it is super fine. Alternatively, you can blend it up in a food processor. You don’t want any large lumps in the mix! Slowly stir the meringue into the dry mixture. Add 1 cup of meringue and then stir around the side of the bowl 2 or 3 times and then punch down the center with your spatula. Once the mixture is smooth and ribboning, you’re ready to pipe! Fill a pastry bag with a circle tip and pipe small 1 1/5″ – 2″ circles on a baking sheet lined with parchment paper or a silicone mat. Gently tap cookie sheet on counter a few times to help air pockets escape. 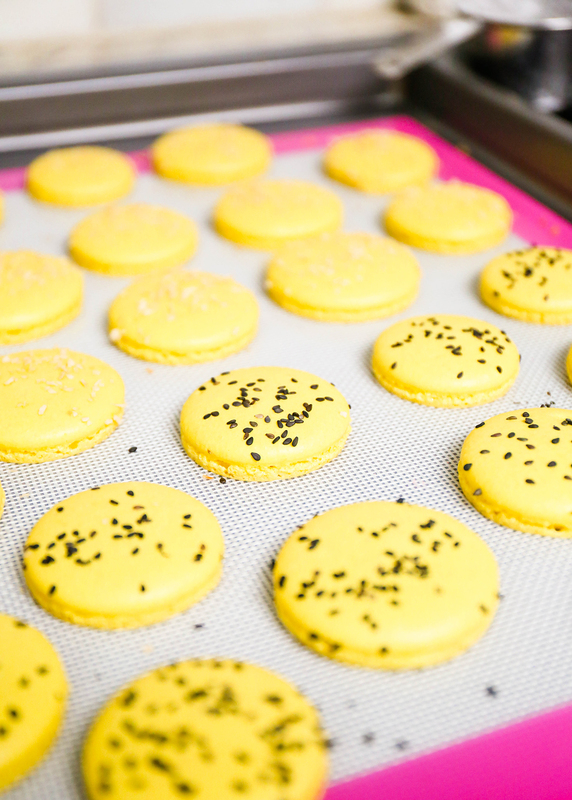 Sprinkle toppings if necessary and allow macarons to sit at room temperature for 30 minutes. Once you can tap the tops and they’re not sticky, it’s time to bake. Bake for 15-18 minutes at 275 degrees Fahrenheit. Remove from the oven and allow to cool for 20 minutes. 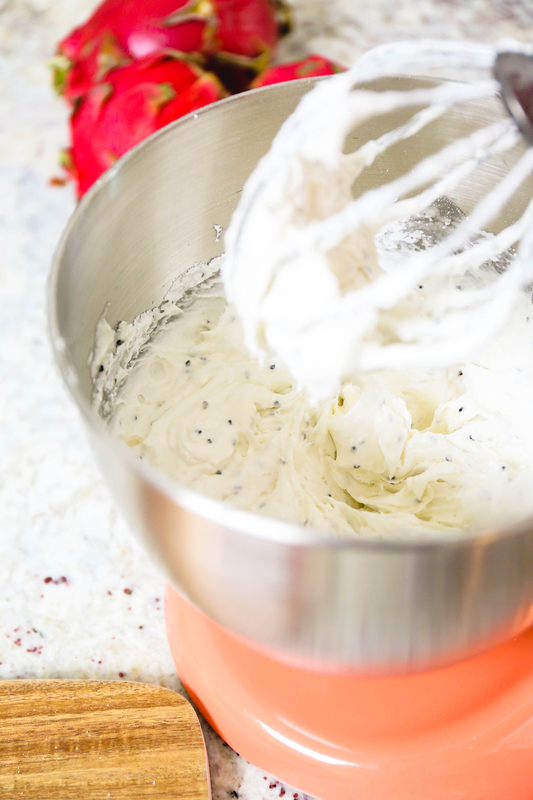 Remove from the pan and set aside while mixing up the buttercream. In the bowl of a stand mixer, beat the butter on high for 2 minutes. Slowly add the confectioner’s sugar and continue to beat until well-incorporated. 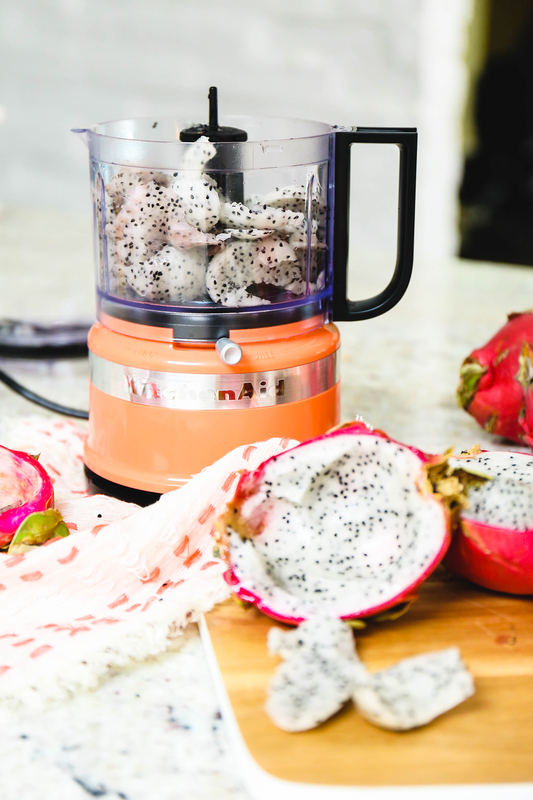 Using a spoon or melon baller, remove the inside of the dragonfruit and puree with a food processor or blender. 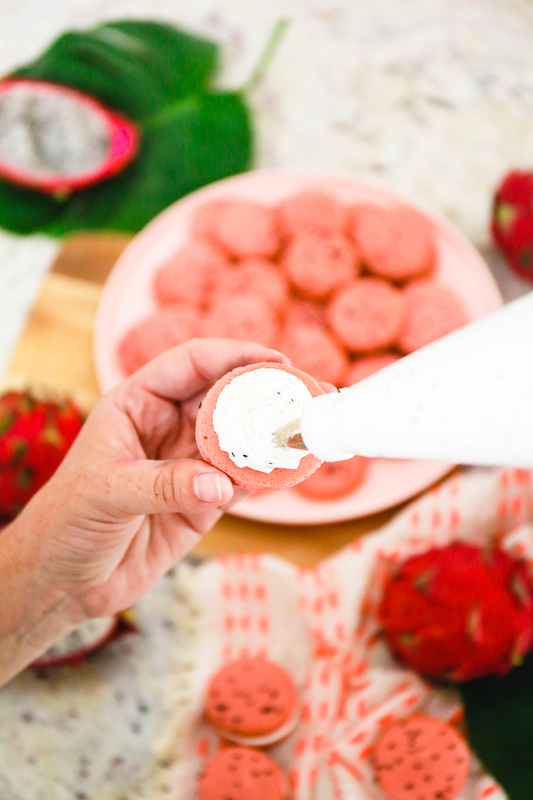 Add the dragonfruit puree a little at a time until you’ve reached the desired buttercream consistency. Fill a piping bag with frosting and pipe a small amount onto the bottom of one macaron. Gently sandwich the buttercream with another macaron. Repeat until all macarons are used up and enjoy! *May keep chilled in the refrigerator for one week, but they will be gobbled up before then! Gorgeous! I seriously want to try these! I have major fears taking on macaroons though. I may need to try making these with mg favorite little girl!! These are the prettiest! We are currently in Taiwan and have been eating a lot of the fresh dragon fruit! I want to take some home with me! Lex! These look seriously amazing! I love macaroons! These look absolutely amazing. Love the bright colors too! 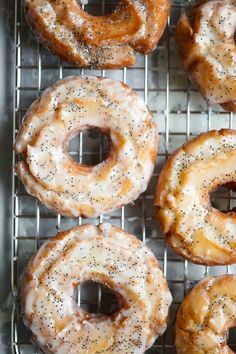 Think I will need to make these ASAP. They almost look too pretty to eat…ALMOST. I LOVE the color scheme you’ve got going on here. I’m so jealous of your mixer! Yummy! I love the bright colors! Macarons! I have always wanted to make these! Pinning this for later! These turned out so cute! Does the fruit make the frosting curdle at all? It looks yummy but i’m just wondering how it holds up! Good job! Dragonfruit buttercream? I just died and went to heaven. These macaroons are beautiful. And the birds of paradise color is top notch! I’ve never had these, but they look delish and so retry. I will have to give these a try at my next book club. 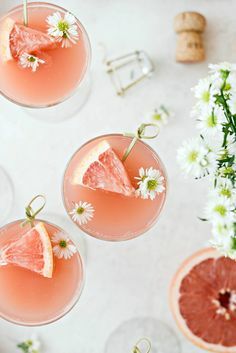 Found you through Mo Mojo and just wanted to say your blog is beautiful! These are insane. You’re magic.